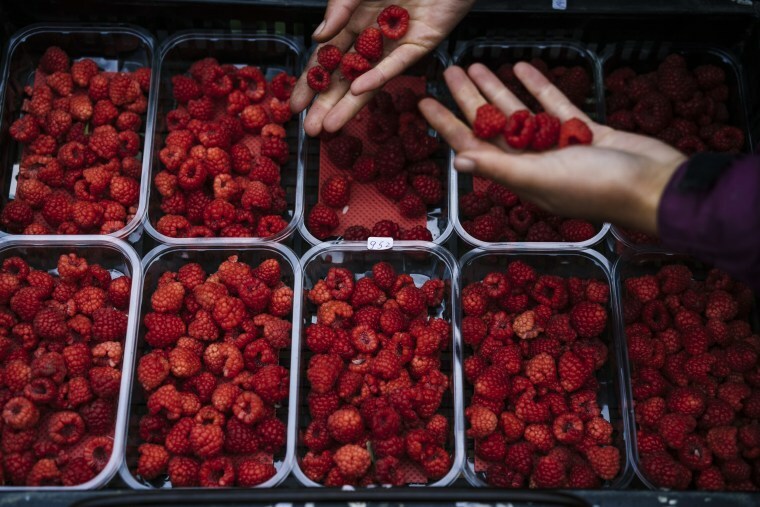 KENT, England — Fruit grower Tim Chambers left 150 tons of raspberries, worth just over $1 million, to rot on the bush in June. With too few laborers to pick produce on his farms, he also decided not to plant a good portion of the late-season raspberries that he usually harvests in the fall. He’s not alone. Fruit and vegetable growers across Britain are suffering from a sharp decrease in seasonal workers from other European Union nations who make the harvest possible. Each year, the U.K. needs about 80,000 seasonal workers to harvest fruit and vegetables, according to the National Farmers Union (NFU). In recent years, 75 percent have come from Romania and Bulgaria. However, a drop in the value of the British pound after the June 2016 Brexit vote, and uncertainty over the future of visa-free cross-border movement once the U.K. leaves the bloc in March 2019, has made Britain a much less attractive place for workers. Booming economies in Romania and Bulgaria have exacerbated the situation, with many workers taking the opportunity to earn money at home. “Normally, our workers would be booking to come back to us next year, but they aren’t committing,” said Chambers, who provides accommodation in trailers for more than 1,000 workers across his farms in Kent, a county in Southeast England. “They are waiting to see what alternatives they have, which way the exchange rate will go, whether it’s attractive to work here or elsewhere in Europe." This is a new phenomenon, according to Chambers, who said that during the previous seven or eight years he didn't have any problems recruiting workers. Despite giving fruit growers like Chambers a headache, British lawmakers are pushing ahead with Brexit negotiations, and this week debated the E.U. withdrawal bill in Parliament. Britain voted to leave the European Union by 52 percent to 48 percent in last year's referendum. Despite warnings from many farming unions about labor shortages, many of Britain's farmers were among those voting to leave the union. Chambers is among them — and still says he has yet to regret the decision, despite his losses. But as negotiations gather pace and the economic repercussions sink in, polls suggest that popular support for Brexit is indeed slipping — a regret for Brexit that has been dubbed "Bregret." The National Farmers Union estimates that Britain's farms were 29 percent short of migrant laborers in September. While farmers would like to hire local workers, few are available to step in thanks to record low unemployment. Recruiter Alexandru Barbacaru, of Romania-based Est-Vest Services, has worked with U.K. growers for the past 18 years. He said this year has been the hardest, with migrant workers choosing Germany, Denmark and the Netherlands over Britain. In August, at the height of the harvest, he had around 170 unfilled job listings for U.K. farms, while at the tail end of the season in November, around 100 jobs remained unfilled. “Last year we recruited 5,000 people. This year if we get 3,600 we will be lucky,” he said from his office in Bucharest. Workers “come to the U.K. when there is no other choice,” he added. On Chambers’ farms, nearly all of the workers come from abroad, with the majority from the E.U. They speak little English and socialize solely with the other laborers. They live together in rows of trailers next to the mesh-covered tunnels where the fruit grows. The farm provides transport to a local supermarket on their day off. During the picking season, workers are bused between Chambers' fields dotted around the countryside. When the ripe fruit in one area is picked for the day, they move to the next. Work on the farms starts early and is tedious, especially once the weather turns. Bundled up in hats, gloves and rubber rain boots, pickers make their way down the long, narrow rows, carrying trays lined with small plastic boxes for the fruit. Elena Hoola, 24, came to work as a picker a year and a half ago from Craiova, Romania, and plans to return next July. “I came here to make money quickly,” she said, rubbing her raw hands together as she stood in mud outside the tunnels where she picks raspberries six days a week. In contrast, some of the farms’ older workers, who came 10 to 20 years ago, said they were staying on in the belief that longer-term opportunities in Britain were greater. “Who doesn’t want to go home? But I don’t have that choice,” said Yumer Mustafa, 36, a tunnel manager who arrived in 2005 from Bulgaria as a seasonal laborer. He has used his earnings to buy an apartment and a house in his hometown, Rupcha, but said he has no plan to quit in the near future. “I can’t plan for five years from now. I am worried about the future here with Brexit,” he added. Growers, meanwhile, are doing everything they can to attract new workers. Chambers is planning a trip to Bulgaria at the end of November to meet potential recruits face-to-face. Barfoots, which employs between 800 and 1,000 workers during the busy season, has improved the accommodation it offers and is now looking at new ways to support workers when they are here. This year, the farm was around 15 percent short of the workers it needed. “We got through the season without leaving crops in the fields but the picture for future years is uncertain,” Barfoots managing director Julian Marks said. Sarah Calcutt, the general manager for Avalon Growers, a cooperative of 21 apple and pear growers, says that farmers are getting more creative and offering new incentives to workers ranging from parties and excursions to cooking lessons for local specialties. Even so, growers are bracing for more severe shortages next year— along with the possibility that a good portion of their produce could rot before it gets picked. If the shortage continues or worsens, as many predict, farmers say they may stop growing some labor-intensive crops altogether. “Iconic British asparagus, courgette [zucchini], tender stem broccoli, the humble Halloween pumpkin — each one lifted off the ground by a human, polished and put into a box — all those crops will be impacted,” Marks said. Consumers will also likely face higher bills at the supermarket. With labor accounting for between 10 and 60 percent of the cost of growing fruit and vegetables, even modest wage rises can mean a rise in grocery prices. In the meantime, the National Farmers Union and other industry organizations are pushing the government for more clarity on how it plans to handle EU citizens’ rights as well as immigration from non-EU countries. Some growers are asking for workers from non-EU nations, such as Ukraine, to be granted seasonal worker visas. But talk of further immigration is politically toxic in Britain, where tougher border controls were a key factor in the appeal of Brexit, so such visas are unlikely to be issued in the near future. With so little certainty about the future, farmers are unsure how to make crucial decisions for their U.K. operations. Chambers has made an investment worth several hundred thousand dollars in a farming joint venture in Poland — heading east for financial stability only a decade after migrant workers headed west.